A government paper leaked to the media (Telegraph 17 January 2019) suggests that it would take more than a year to hold a second referendum on Brexit. 11 weeks between legislation and polling day, including 1 week for preparation, 4 weeks for campaign groups to organise, 2 weeks for ‘lead’ campaign groups to be designated, and 4 weeks for the final campaign. The last three of these timings are set out in the Political Parties, Elections and Referendums Act 2000. The report finds that those who claim a referendum could be held in a matter of just a few weeks are misguided. A referendum cannot be held without passing new primary legislation. Processes of testing the question and designating ‘lead’ campaigners were introduced to ensure that referendums are fair. To sidestep these protections would undermine the legitimacy of the result. A referendum could also require longer than 22 weeks (though still much less than 12 months), particularly if it took an innovative form such as a three-option question. Further information on the question format are available in the full report. Preparations for the 2016 referendum took 13 months, including 7 months to pass legislation. However, there was no time pressure in this case and if the majority in parliament wanted a referendum, it would be possible to legislate much more quickly. The government paper allows 7 months to pass legislation and 12 weeks for the Electoral Commission to test the question. But these processes would run concurrently, not in sequence. The government paper says 22 weeks would be needed between the passage of legislation and polling day. In the 2011 referendum on the voting system, however, the equivalent period was only 11 weeks. 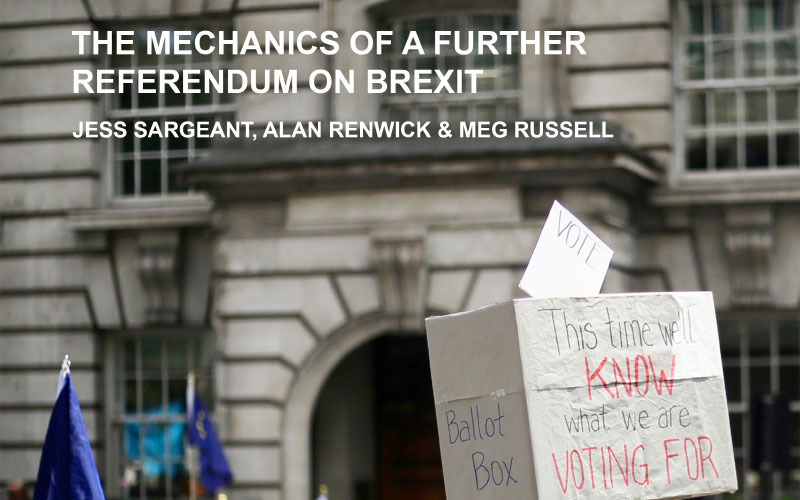 UCL Constitution Unit’s report, The Mechanics of a Further Referendum on Brexit, was co-authored by Jess Sargeant, Alan Renwick and Meg Russell, and published in October 2018. Dr Alan Renwick is available for interview. The Constitution Unit is a research institute based within the Department of Political Science at University College London. It conducts timely, rigorous, independent research into constitutional change and the reform of political institutions. Its research has significant real-world impact, informing policy-makers engaged in such changes – both in the United Kingdom and around the world. UCL was founded in 1826. We were the first English university established after Oxford and Cambridge, the first to open up university education to those previously excluded from it, and the first to provide systematic teaching of law, architecture and medicine. We are among the world's top universities, as reflected by performance in a range of international rankings and tables. UCL currently has over 39,000 students from 150 countries and over 12,500 staff.